One of the most common axiom of investing is that themes or ideas will fall in and out of favor. When markets love an idea, asset prices that best represent those ideas will be bid up and like wise when investors fall out of love of the same ideas. For example in commodities, iron ore (Rio Tinto) and gold. Emerging markets has steadily falling out investors favor in the last couple years. The bleak outlook for the major emerging markets is in contrast to the golden years post the technological bubble burst and immediately after the financial crises where it became a safe haven for investors in a low growth world. It was expected that the creation of middle class in these countries resulting in higher disposal income would create an opportunity for new companies and expansion of global market for all. Since then this notion has been shattered where the most well known emerging markets such as Brazil, Russia, India and China (BRIC) has hit stumbling blocks. Brazil is a mess, the fall in oil price showed the commodity dependency of Russia. China follow crack down on corruption and slowing economic growth has inverted the idea that the economic gravity is shifting to Asia. India is the only bright spot in within the context of the BRIC nations following the election of Modi government. However it is too soon to judge the long term implications as India perennially over promise and under deliver. Thematic investing is no different where investors apprehension to emerging market has created opportunity for value conscious investors as a entry point or add to existing positions. Australian investors can use these exchange traded funds to gain exposure to a broad basket of emerging markets. These are index tracking products which means the return of the funds will match an Emerging Market index (like the ALL ORD or ASX 50 Index). The index includes a broad basket of companies listed across a number of emerging markets. iShares, Vanguard and State Street each has their own Emerging Market ETF product on the ASX. Table above breakdown the annual fee and total companies included in their respective funds. These are market cap weighted funds which means that the size of the holdings in the fund is based on the relative size of the company in the index. The larger the company, greater the weighting. One stand out fact is that all 3 index funds using number company holdings as a key indicator, are diversified. Even WEMG with more than 340 company holdings in the portfolio is a well diversified fund. No single company will affect the fund performance. Typically, dividend yield are lower for Emerging Market ETFs. The low dividend yield is due to companies needing to retain the earning to fund growth. Currently, the fall in the share prices has created opportunity to receive higher than historical dividend yield. The advantage of using a market cap weighted ETF is the investments are in large and well known to a degree. It eliminate so governance risk which is much higher than developed markets. 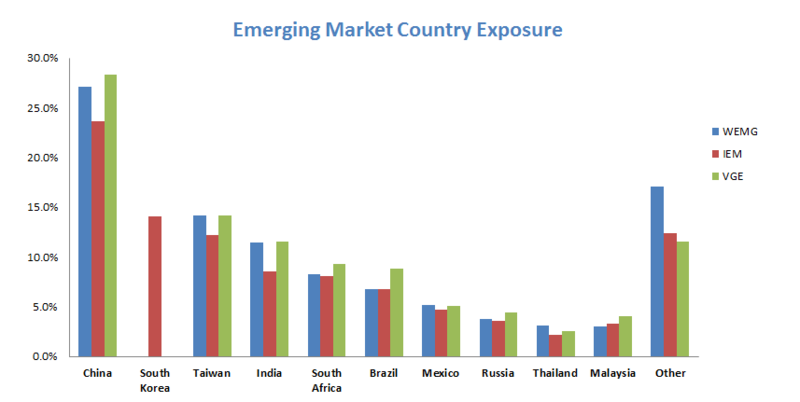 Figure above breaks down the country allocation of each Emerging Market ETF. With the exception of South Korea for IEM. There are a number of similar exposures across various countries. The common countries in these exchange traded funds include China, Taiwan, India, South Africa, Brazil and Mexico. Total allocation vary only marginally. Currency risk is one of the largest risks investors should be aware of when investing in these funds. As these are unhedged ETFs. Any appreciation of the AUD would wipe away underlying equity increases.